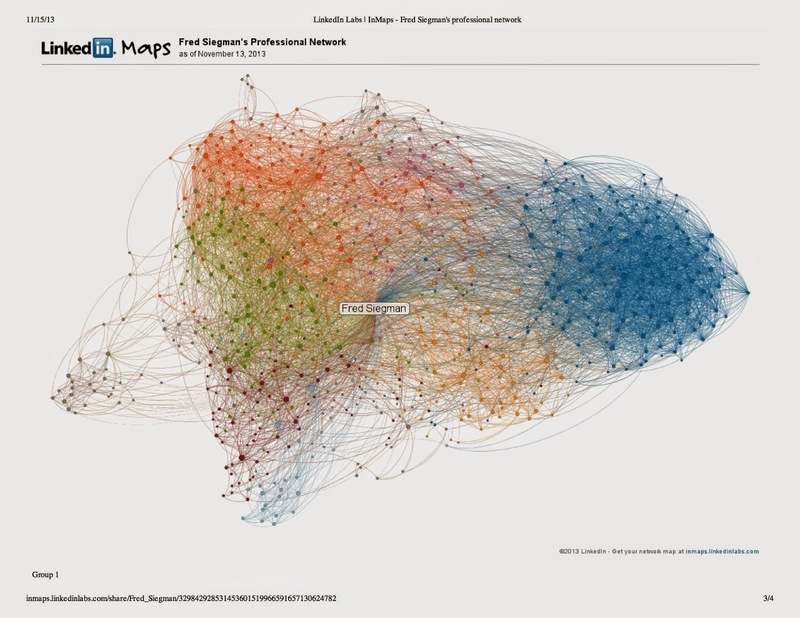 Until September 1, 2014 LinkedIn offers you a great free tool to visualize your network: inmaps.linkedinlabs.com. So what can you learn from a map of your connections? If you find most of your connections appear in one cluster, you have surrounded yourself with people just like you. That limits your perspective when you try to find answers to complex questions. Everyone thinks like you do! It can also have other negative impacts. For example, information about job opportunities often comes from people outside your closest relationships. Your close connections frequently travel in the same circles, know the same people. Maybe your map will show multiple clusters with gaps between them. Many of the ones people have shared with me look like flowers with long lines extending out from the center to a cluster at the end. If you find gaps like that, look to connect your contacts in different clusters in your network who will benefit from that introduction. Chances are, you will too! As a Serial Connector™my network map shows several clusters with minimal gaps. By the way, see that little one hanging out to the left on my map; some friends from high school connected to me. I use Facebook for my social connecting.